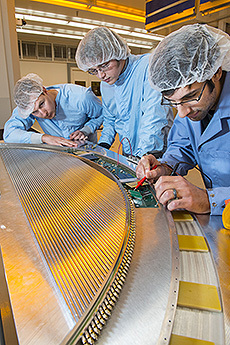 Researchers are one step closer to finding new physics with the completion of a harp-shaped prototype detector element for the Mu2e experiment. Mu2e will look for the conversion of a muon to only an electron (with no other particles emitted) — something predicted but never before seen. This experiment will help scientists better understand how these heavy cousins of the electron decay. A successful sighting would bring us nearer to a unifying theory of the four forces of nature. The experiment will be 10,000 times as sensitive as other experiments looking for this conversion, and a crucial part is the detector that will track the whizzing electrons. Researchers want to find one whose sole signature is its energy of 105 MeV, indicating that it is the product of the elusive muon decay. In order to measure the electron, scientists track the helical path it takes through the detector. But there’s a catch. Every interaction with detector material skews the path of the electron slightly, disturbing the measurement. The challenge for Mu2e designers is thus to make a detector with as little material as possible, says Mu2e scientist Vadim Rusu. “You want to detect the electron with nothing — and this is as close to nothing as we can get,” he said. So how to detect the invisible using as little as possible? That’s where the Mu2e tracker design comes in. Panels made of thin straws of metalized Mylar, each only 15 microns thick, will sit inside a cylindrical magnet. Rusu says that these are the thinnest straws that people have ever used in a particle physics experiment. These straws, filled with a combination of argon and carbon dioxide gas and threaded with a thin wire, will wait in vacuum for the electrons. Circuit boards placed on both ends of the straws will gather the electrical signal produced when electrons hit the gas inside the straw. Scientists will measure the arrival times at each end of the wire to help accurately plot the electron’s overall trajectory. “This is another tricky thing that very few have attempted in the past,” Rusu said. The group working on the Mu2e tracker electronics have also created the tiny, low-power circuit boards that will sit at the end of each straw. With limited space to run cooling lines, necessary features that whisk away heat that would otherwise sit in the vacuum, the electronics needed to be as cool and small as possible. “We actually spent a lot of time designing very low-power electronics,” Rusu said. This first prototype, which researchers began putting together in October, gives scientists a chance to work out kinks, improve design and assembly procedures, and develop the necessary components. One lesson already learned? Machining curved metal with elongated holes that can properly hold the straws is difficult and expensive. The solution? Using 3-D printing to make a high-tech, transparent plastic version instead. Researchers also came up with a system to properly stretch the straws into place. While running a current through the straw, they use a magnet to pluck the straw — just like strumming a guitar string — and measure the vibration. This lets them set the proper tension that will keep the straw straight throughout the lifetime of the experiment. Although the first prototype of the tracker is complete, scientists are already hard at work on a second version (using the 3D-printed plastic), which should be ready in June or July. The prototype will then be tested for leaks and to see if the electronics pick up and transmit signals properly. A recent review of Mu2e went well, and Rusu expects work on the tracker construction to begin in 2016.